Note: these are unfinished, cast metal pieces. Don't forget to wash them (just soap and water... but probably with an old toothbrush, too) to get rid of any oil or mold-release residue so your paint will stick well. 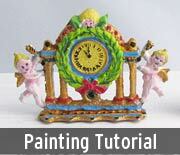 See the tutorial by Design Team Member Lora Mahaffey for more info on prepping and painting cast metal miniatures. Or just spray paint! Just give them a bath to prep and use spray paint for a solid color (as a base coat or final color). Most of these items are Dollhouse 1:12 Scale.